“Ghost Rookeries,” narrated by actor, conservationist, and member of the E.O. Wilson Biodiversity Foundation (EOWBF) Board of Advisors Harrison Ford, conveys the story of the Adelie Penguin, whose habitat—and thus the biodiversity of all of Antarctica—is being threatened by real-time environmental changes. The E.O. Wilson Biodiversity Foundation (EOWBF) and the Association of Zoos and Aquariums (AZA) will be embarking on an exciting new initiative beginning in the summer of 2013. 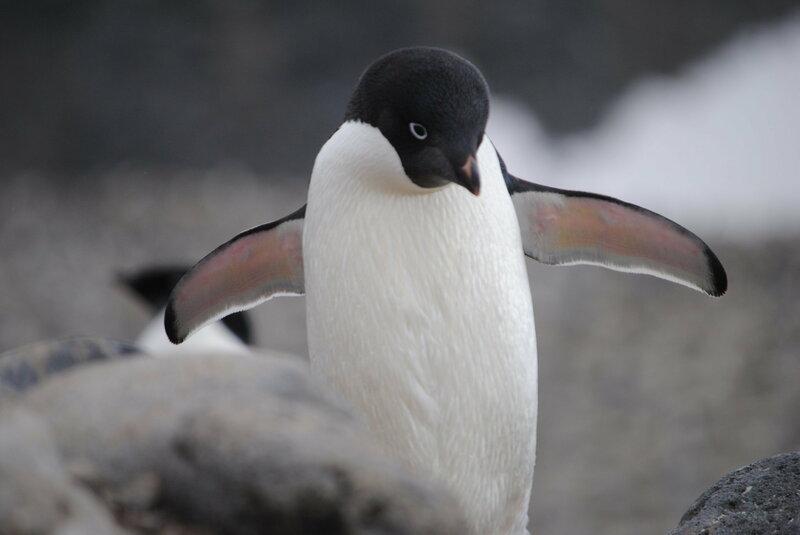 Beginning with “Ghost Rookeries: Climate Change and the Adelie Penguin” (4 minutes, 2013), short videos produced by the EOWBF will be shown at select AZA-accredited zoos and aquariums located in the United States. With the vast reach of AZA-accredited zoos and aquariums, “Ghost Rookeries” and future videos will be seen by millions of visitors. “Ghost Rookeries” was produced by the E.O. Wilson Biodiversity Foundation, with the University of Alabama at Birmingham, and the the Tennessee Aquarium. This film looks at a small part of the Adelie penguin population, on Torgerson Island, near Palmer Station. This population symbolizes the difficulties of dealing with climate change, or even knowing what the effects will be. Critics of pollution control to stop climate change argue that populations of all animals and plants will adapt. Indeed the last decade saw a rise in total numbers of Adelies across Antarctic waters, and Gentoo penguins have set up new colonies to avoid warming air and waters. More careful watchers note problems, though. Warming air, and decreasing hard ice, brings more snow — nominally good, if one assumes the snow turns to ice. In this case, the snows are brief, and they melt quickly. It’s the cold meltwater that kills the chicks, drowning them. This may be counterintuitive, or even ironic, that warming causes a cold water seabird to drown, or die of hypothermia. Nature is stranger than we can imagine, and often strange enough that it defies the understanding of scientifically-dilettante politicians. Generally the loss of ice is the biggest problem for penguins; specific populations face entirely different threats, however, depending on the local effects of climate change. 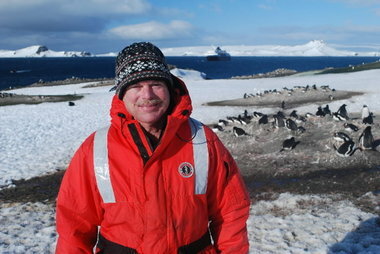 Dr. Jim McClintock, in Antarctica. A professor at the University of Alabama-Birmingham, he wrote Antarctica Lost, upon which the film about the Adelie penguins is based. The film is a short project based off of the work of Dr. Jim McClintock, an almost-legendary Antarctic researcher based out of the University of Alabama at Birmingham (UAB). McClintock published a book on his work last year that deals with many different aspects of climate change in the Southern Ocean and its continental land mass, Lost Antarctica, Adventures in a Disappearing Land. This entry was posted on Monday, July 22nd, 2013 at 7:46 am and is filed under Antarctica, Climate change, climate_change, Geography - Physical, Global warming, History, Nature, Science. You can follow any responses to this entry through the RSS 2.0 feed. You can leave a response, or trackback from your own site.